As Corporate Occupation/Corporate Watch has previously reported (see here) SodaStream, an Israeli carbonated beverages manufacturer, has recently opened a shop called EcoStream in Brighton. SodaStream products are also stocked by major retailers such as Robert Dyas, John Lewis, Argos, Comet, Lakeland, Conran and some Tesco, Sainsbury and Asda stores. The Brighton shop is their first in the UK, the location was chosen because of the city’s green credentials. SodaStream has a manufacturing plant in the illegal Mishor Adumim settlement industrial zone in the West Bank. Settlement industrial zones are at the forefront of Israel’s occupation of Palestine. The Israeli government supports the growth of business on occupied land through special tax incentives, and lax enforcement of environmental and labour laws. Mishor Adumim is part of the Ma’ale Adumim settlement bloc. Located just outside of the boundaries of Jerusalem, Ma’ale Adumim is the third largest and quickest growing settlement in the West Bank, and had a population of 39,000 people in 2011. Both the industrial zone and the residential areas are part of Israel’s controversial “East 1” project. Initiated by Yitzhak Rabin in 1995, the project aims to cut the West Bank off from East Jerusalem though strategic settlement expansion, hence destroying any prospect of a viable Palestinian state. Ma’ale Adumim was built on land stolen from the Palestinian villages of Abu Dis, Al Izriyyeh, Al Issawiyyeh, Al Tur, Khan al Ahmar and Anata. Its construction caused the eviction of many the Jahalin Bedouin. For the last two weeks, demonstrations have been held outside EcoStream by boycott divestment and sanctions activists who have been telling the public about the reality of SodaStream’s business. In response EcoStream has issued a bulletin, handed-out in front of their store during the protest last Saturday, which tells potential customers to “PLEASE BE AWARE THAT BDS IS A POLITICALLY-ORIENTATED MOVEMENT”. In the bulletin they try to shut down the arguments made by protesters by claiming that Mishor Adumim is not located on occupied territory as Area C is “disputed” – not occupied – land, that Palestinians benefit from the employment provided by SodaStream in Misor Adumim and will be harmed by the boycott and, finally, that article 49 of the Geneva convention is not applicable to Israeli settlements. (please see here for the full wording of the bulletin). Demonstrations will continue every Saturday between 1pm and 3pm outside EcoStream, 142 Western Road, Brighton. As you have been made aware shoppers in the UK have a number of concerns about SodaStream’s business in the West Bank. 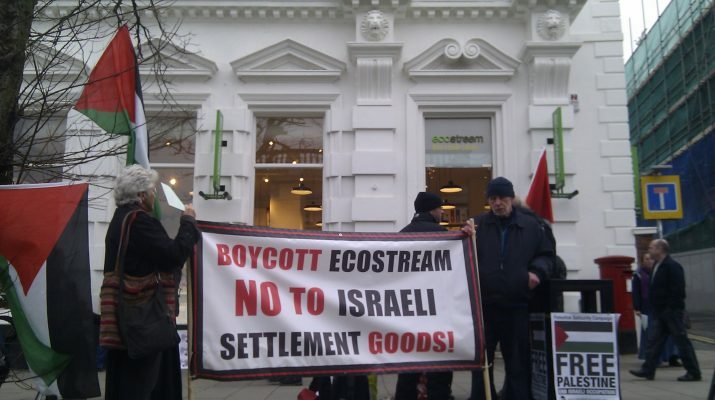 The new EcoStream store in Brighton promotes itself as an ethical and eco-friendly business, but this does not reflect the impact SodaStream, as a settlement company, has on Palestinians living in the area around Mishor Adumim industrial zone. As you yourselves point out Mishor Adumim is located in area C in the West Bank. Over 60% of the West Bank was designated as Area C (under full Israeli control) under the Oslo accords. According to the Oslo accords, the transfer of control from Israel to the PA of non built up sections in Area C was supposed to have started in the late 1990’s. However there has been no movement on this in the last decade, whilst the number of settlers have increased (Oslo text). The fact is, there can be no economically viable Palestinian state as long as Israel controls area C.
Palestinians living in area C are the ones most affected by the Israeli occupation. Prohibited from building or repairing houses, they often have limited access to services and water resources and are frequently given demolition orders for their homes that are already there. In 2011 alone, 560 Palestinian-owned structures, including 200 residential structures and 46 rainwater collection cisterns and pools, were demolished by the Israeli authorities leaving 1,006 people, including 565 children homeless (See here). During the first half of this year, demolitions in area C increased. Only last week, the Jahalin Bedouin of Khan al Ahmar, who live on the outskirts of the industrial zone where SodaStream trades from, went to court to try to save their primary school from demolition due to planned settlement expansion. They have been told that their whole community should be relocated (see here). There is no doubt that the consensus view amongst the international community -including the International Court of Justice, UN bodies and the International Committee of the Red Cross- is that Area C is occupied territory. During the Oslo accords all Israeli settlements were designated Area C status. Israeli settlements have time and again been declared illegal in international law, and in breach of article 49 of the Geneva Convention which reads “The occupying power shall not deport or transfer parts of its own population into the territories it occupies.” (For the full article 49 wording see here). “In accordance with a number of resolutions adopted by the United Nations General Assembly and Security Council and by the International Conference of the Red Cross and Red Crescent, which reflect the view of the international community, the ICRC has always affirmed the de jure applicability of the Fourth Geneva Convention to the territories occupied since 1967 by the State of Israel, including East Jerusalem. This Convention, ratified by Israel in 1951, remains fully applicable and relevant in the current context of violence […] In particular, the ICRC has expressed growing concern about the consequences in humanitarian terms of the establishment of Israeli settlements in the occupied territories, in violation of the Fourth Geneva Convention” (Full text: www.icrc.org/eng/resources/documents/misc/5fldpj.htm). Parts of the Fourth Geneva convention were formally enacted into English law, in line with the Rome Statute of the International Criminal Court, in the International Criminal Court Act (2001), this lists “The transfer, directly or indirectly, by the Occupying Power of parts of its own civilian population into the territory it occupies, or the deportation or transfer of all or parts of the population of the occupied territory within or outside this territory” as a “serious violation” and a “war crime”. This clearly applies to Israel’s settlements and contradicts SodaStream’s claims. Furthermore the British Foreign and Commonwealth Office (FCO) has this to say about settlements: “Israeli settlement activity is a major barrier to our pursuit of a lasting peace agreement in the Middle East. Settlements are not only illegal under international law and in direct contravention of Israel’s Roadmap commitments, but more practically they represent an attempt to create ‘facts on the ground’ which make a two-state solution harder to achieve.”(see here). (Full response to the group from SodaStream and Stop Sodastrean Italia’s reply at www.bdsitalia.org/index.php/english-menu/280-reply-sodastream). Furthermore, Palestinian communities will never see any positive impact of SodaStream’s success. Any financial success of the company aids the development of the illegal settlements, pushing Palestinians out and refusing them any access to international markets to create an independent economy. It is true that conditions at the Mishor Adumim factory may now be better than in many settlements. However, this has only come about because of consistent industrial action, protests and and media pressure. When some workers went on strike to protest the conditions in the factory in 2008, 17 of them were fired and were only re-employed after the intervention of the Israeli workers-rights organisation Kav LaOved and after getting bad press in Sweden, which is one of SodaStream’s biggest markets. Despite this, the story repeated itself again in 2010 when 140 workers were fired without getting paid the wages owed to them. Again they were reinstated after campaigning by Kav LaOved. Kav LaOved now claims to be unable to obtain information about current working conditions due to the risk of dismissal for workers who speak to them. Corporate Watch conducted interviews with over 60 settlement workers in the West Bank, including workers from Mishor Adumim, during 2010. Some see working in a settlement as their only option, but we have yet to meet any worker who sees it as a positive thing or a viable long term solution. We have also yet to meet anyone getting the vacation and maternity benefits that you state that SodaStream provides to its Mishor Adumim workers and would appreciate any evidence you might be able to provide to back this up. While UK government guidance currently does not specifically restrict the sale of settlement goods it does clearly state that settlements are illegal and there is a compelling legal argument to say that products produced in the settlements are the proceeds of crime. 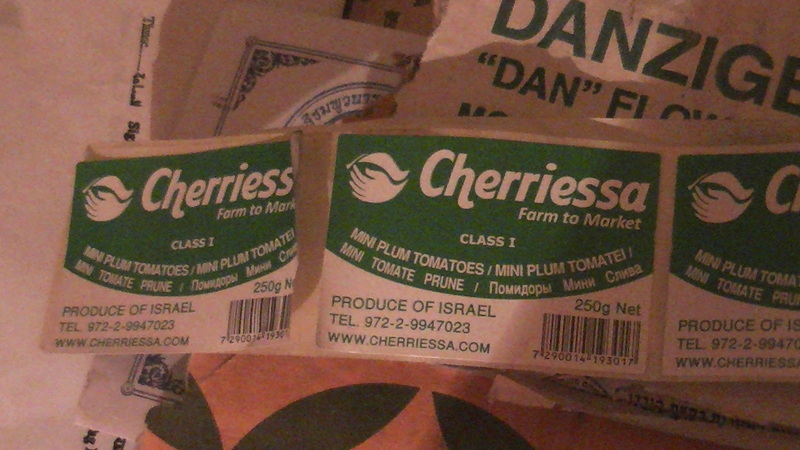 It would also clearly be illegal and against trade regulations to export any products made in Mishor Adumim as ‘produce of Israel’, or for that produce to benefit from the EU-Israel preferential trade agreement. However, regardless of government legislation, we would like to appeal to the public for a boycott of EcoStream’s store in solidarity with Palestinians struggling against a brutal occupation. Businesses like EcosStream’s serve to cement and expand Israeli control of Palestinian land and perpetuate the oppression of Palestinians.